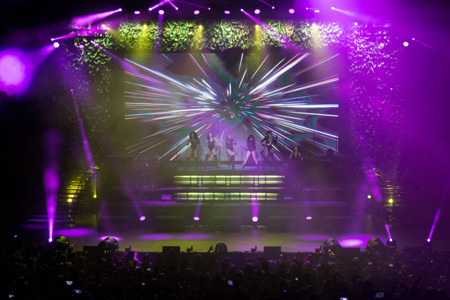 Fifth Harmony’s 7/27 Tour was met with resounding applause throughout their impressive concert at the Irvine Meadows Amphitheater on September 9th. This incredible production showcased powerful performances from their sophomore album 7/27, which was released in May. Fan favorites punctuated this astounding show, vibrantly bringing to life their hit summer tracks, such as “Work from Home,” which has surpassed 900 million views on YouTube in the past six months. The band, which includes members Ally Brooke, Normani Kordei, Dinah Jane, Camila Cabello, and Lauren Jauregui put on an energetic performance filled with stunning choreography, powerful vocals and trend-setting outfits. Those looking for an exciting, end-of-summer concert experience were surely left satisfied…because these girls brought the heat! 7/27 is available on iTunes and in all digital music platforms.